One of my great enjoyments is keeping an illustrated journal, although because of a lack of time it tends to be rather intermittent – it’s just so stress-free to paint or sketch for yourself and add notes about your experiences, and this is especially rewarding on a holiday or journey. I am therefore pleased to announce that I have teamed up with Leisure Painter Magazine over the next six months to offer a monthly competition to encourage folk to get out and try their hand at producing a journal. Jakar International have kindly agreed to supply the monthly prizes, so do please have a look at the current (April) issue of Leisure Painter. The illustration shown right is taken from my sketchbook-journal done on a visit to Holland, and shows the typical notes I often add beside the picture. 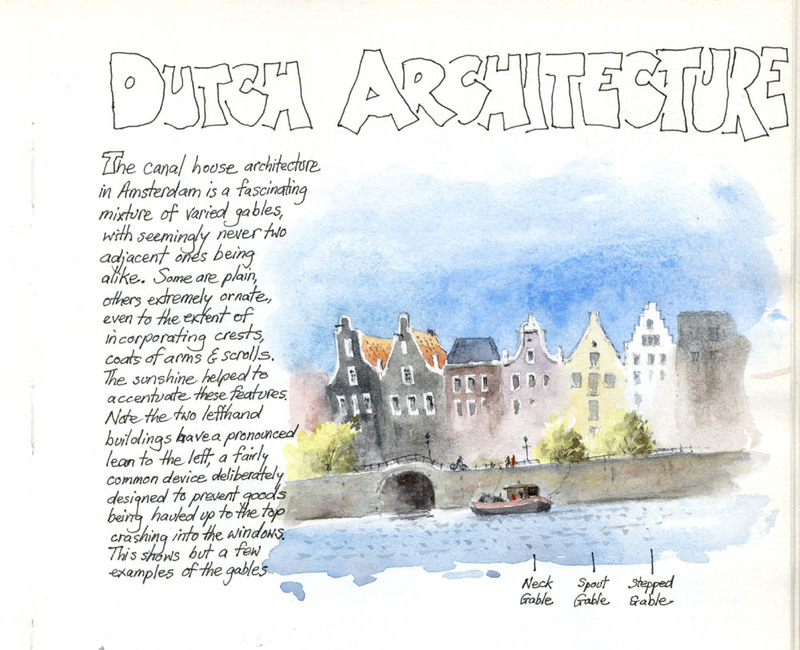 I don’t really class this as a sketch, as I feel it is more of a diagram drawn solely to illustrate the fascinating architectural styles in Old Amsterdam. I had no intention of creating a finished painting from this: it was done for my enjoyment, although many other sketches in the A4 book were intended as sources for future paintings. Working this way, with no pressure to produce a brilliant piece of artwork can be liberating as well as helping your work to improve. The houses varied from colourful to a more drab colour, so it’s a good idea to pick out those colours that appeal most to you, rather than paint every house exactly as you see it before you. Note that I have run most of the house colours into one another, rather than paint each one with individual exactitude. I have left out a great many windows, but feel I should have omitted even more, or at least reduced the strength of detail is some. 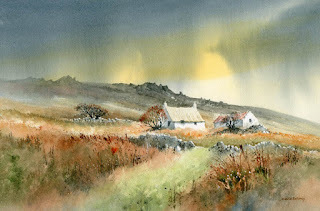 I shall look forward to seeing how you all fare in these competitions, and I must point out that this is not limited to those who travel far and wide – you are very welcome to join in even if you are house-bound, and there are many ideas for you in my current article in Leisure Painter. Make sure you don’t miss out on the fun! 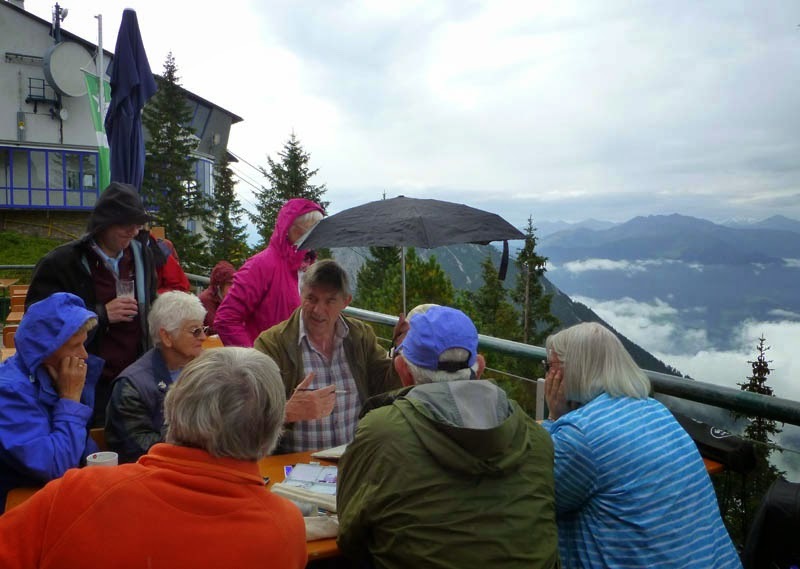 Some of the best painting holidays where we have taken groups have been those which combine spectacular scenery with the more rustic, and this is usually very true of mountain landscapes. 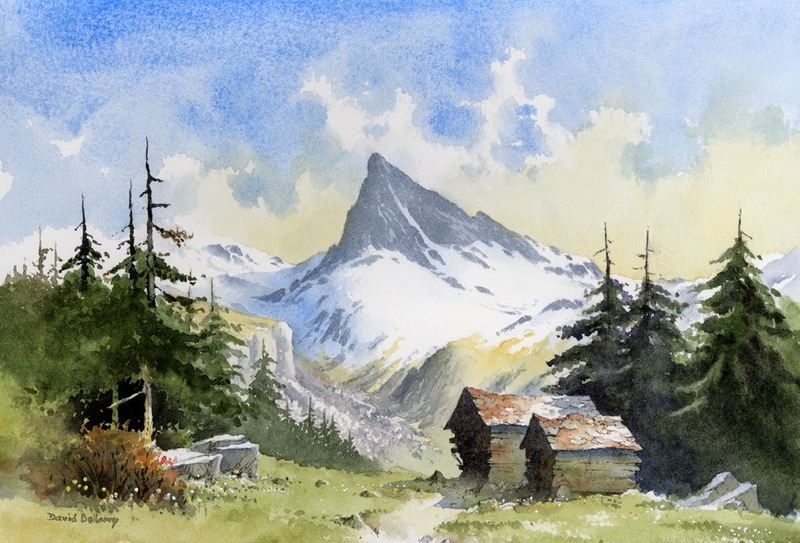 Next summer Jenny and I are taking a group to Zermatt in Switzerland, not just to paint mountain icons like the Matterhorn and the Obergabelhorn, but many other peaks, as well as lakes, mountain streams and the local vernacular architecture. The region is full of exciting prospects for the artist. 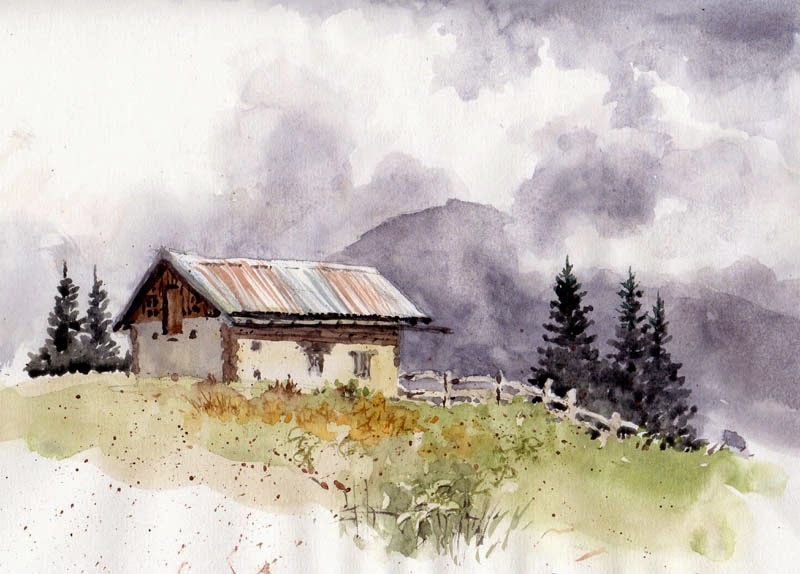 The watercolour shows a pair of stadel barns above Zermatt – these make excellent subjects, especially when set against a backdrop of Alpine peaks. The roofs in this instance particularly interested me with their strong textural variations and colour. It is always good to look for colour in a scene and I often exaggerate warm colours on a focal point such as this, both to reduce the amount of greenery (which can overwhelm a landscape in summer), and to draw the eye towards the centre of interest. Note that the greens in the painting are not really intense greens – the summer grassy pasture is a light, but subdued green, while much of the conifers greenery is more a blue-grey, achieved with French Ultramarine and burnt umber. You don’t have to make the green trees in front of you green! With all that amazing Alpine scenery it’s a truly exciting prospect. I’ve just returned from East Anglia, where I indulged in my passion for maritime scenes and collected a number of sketches of old sailing barges under way in Harwich Harbour. Despite the distractions of a giant ferry crashing into the quay and the subsequent charging around of lifeboats, harbour patrol launches, tugs and kitchen sinks, I managed to achieve some lively images which will be the subject of a future blog. 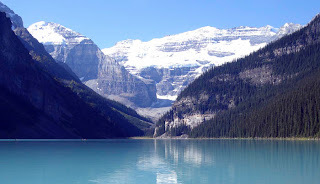 We still have vacancies on our painting holiday to Canada on September 1st when Jenny and I take a group to the Rockies to paint some amazing scenery. I shall be demonstrating how to paint the sublime natural scenery. It is easy to be overawed by such spectacular scenery, so I will be showing how to cope with the big landscape and produce an exciting composition, as well as many other aspects of painting, whether you like to work in watercolour, oils, pastels or whatever. There will be plenty of time to paint and sketch, and if anyone wants to do a little walking that would be great, but it is optional.